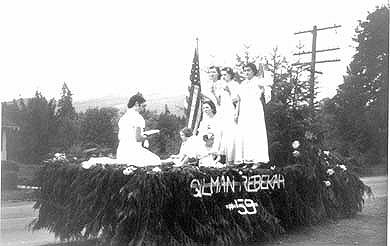 The Press concludes its review of Issaquah Celebrations with this week’s photograph of the float built by Gilman Rebekah Lodge No. 59 for a Labor Day parade in the early 1950s. Riding on the float are (from the left) Velma Chevalier, an unidentified woman, Ann Anderson, Joan Karvia and Ethel Clark. The children are unidentified. The float is decorated with flowers and tree boughs, typical of parade floats of that time.